Here is a great gift idea for the holidays. A little somethin’ somethin’ from the Midwest. Cheese. How can that be wrong? Everyone loves cheese. 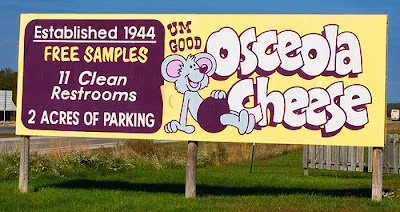 While growing up, my husband, and his family, made a stop at Osceola Cheese almost every time they went down to the Ozarks. Back then, it was just a small little building and it was called the Osceola Cheese Factory. At least that’s what everyone called it. His grandmother always got cheese to take down to the cabin. It had become a family tradition. Today, it has become a destination of sorts. Located in the midst of Amish country, it’s not uncommon to see a black buggy being pulled alongside Missouri Highway 13, where the cheese store is located. Many times we have seen RV’s, motorcycle groups, and camping caravans stopped at the store. What starts off as a much needed bathroom break ends up being a shopping adventure. Osceola Cheese provides samples of their cheeses and snacks all throughout the store. The cheese selection is extensive. They also have fresh creamery butter, Parmesan cheese, a few varieties of goat cheese, lots of hickory smoked cheeses, and just about every flavor of cheddar and jack cheese you can imagine. They also carry a variety of jams, jellies, and preserves. Salty snacks abound. Pork rinds, caramel corn puffs, and crackers. If you are interested, I’ve included their website in a link. Just click on Osceola Cheese. They are also located on facebook. They ship everywhere and take orders both online and over the phone. Disclaimer: Osceola Cheese does not know me. They have never eaten dinner at my house nor have they paid me to say nice things about their company. In fact, I just love their products and stop in every time I’m down in their neck of the woods. This entry was posted in Cheese, Osceola Cheese. Bookmark the permalink. I love,love,love Osceola Cheese. We live in Belton, MO. It's a day trip for us. A long drive for cheese, but worth it.